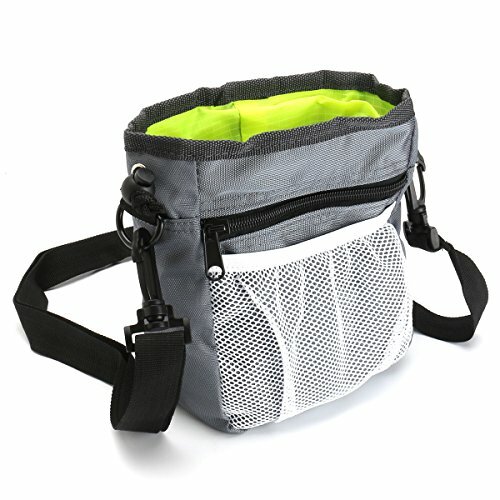 Specification : Material : Nylon,Net Color : Grey Size : approx./18cm*13cm*6cm/7*5*2.5 inches Weight : approx.200g Package Includes: 1 x Pet Dog Training Pouch 1 x Belt 1 x Shoulder strapFeature: 1.Adjustable plastic slider with strap easily to close and open. 2.Extra rubber pad with cross opening for taking poo bags easily 3.There are adjustable and Removable belt.4.Intimate drawstring pocket design, prevent the snacks leakage. 5.Big capacity.can accommodate more stuff, such as clicker, whistle, small toys, etc. Feature: 1.Adjustable plastic slider with strap easily to close and open. 2.Extra rubber pad with cross opening for taking poo bags easily 3.There are adjustable and Removable belt. 4.Intimate drawstring pocket design, prevent the snacks leakage. 5.Big capacity.can accommodate more stuff, such as clicker, whistle, small toys, etc.